On October 13, 2016 the Earth’s magnetosphere collapsed, shrinking the magnetic field about the Earth, hugging the Earth so closely it did not extend out into space. This was an astonishing occurrence not seen before. It took days to return to relative normalcy. As shown by the BATSRUS charts provided by the US government, within an hour, the collapse occurred. Compare this to BATSRUS charts collected earlier in 2016. While BATSRUS has not shown a normal field for some time, and frequently shows a red magnetic blast from Nibiru hitting the bowshock or a curling eddy flow behind the Earth, the Earth’s magnetosphere has never collapsed. 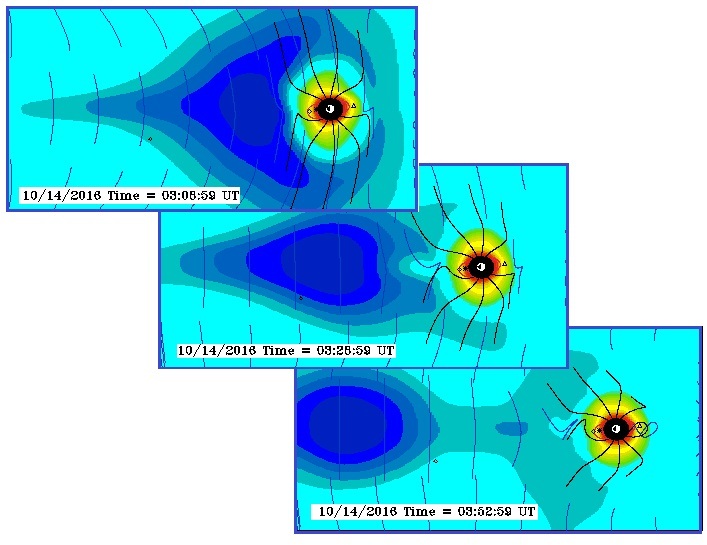 Then, on October 13, 2016 as the hours passed, the magnetic wash that had destroyed the Earth’s magnetosphere gradually reduced, putting the Earth in a reduced magnetic bath so that the field lines emitting from the Earth’s poles began to cautiously emerge again. What on Earth was causing this? The Zetas explain. Magnetosphere way off today October 14, 2016. … The following BATSRUS Y-Cut images recorded on Sept 22-23 show an extraordinarily long magneton eddy flow that persisted for 11 hours. … BATSRUS magnetic field image feed resumed today after a 3-week hiatus. Even with a fragmented image feed provided retroactively between April 7 and April 20, magneton eddy flows and severe compression resulting in loss of both magnetic poles are amply apparent. 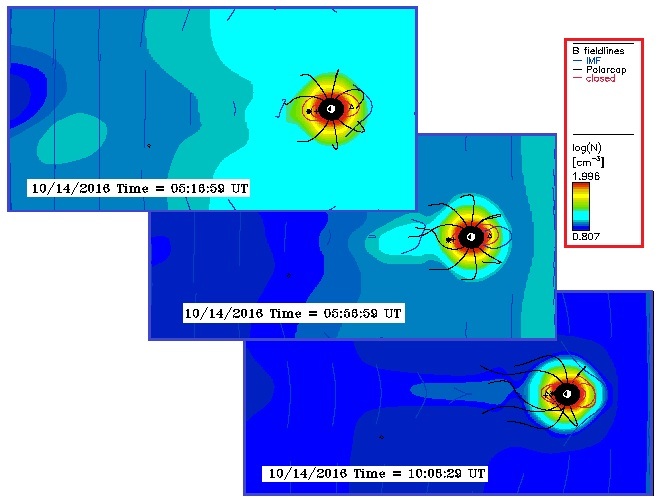 ZetaTalk Confirmation 10/22/2016: Clearly the US government monitors the magnetic storms coming from the magnetic N Pole of Nibiru and the charge in the charged tail as it wafts toward Earth. They know what is coming before it strikes the Earth. The BATSRUS chart from October 14 shows the Earth’s magnetic field literally hugging the Earth, closed so tightly around the Earth that it is not visible out in space. The Earth’s magnetosphere could be considered to have taken to the bunkers! Those wanting the cover-up over Nibiru to continue would like to point the finger at Russia somehow, who is blameless, but Obama and Dunford intend otherwise. If the Earth’s magnetosphere has taken to the bunkers, what about mankind’s electric grid? Increased electro-magnetic pulse (EMP) has huge ramifications for mankind’s infrastructure. Significantly, in the hours before the Earth’s magnetic field disappeared, an Executive Order (EO) signed by Obama was posted on the White House site. This was dated October 13, showing that it had been compiled well ahead of the dramatic impact on the Earth’s magnetic field. Yes, all those probes peeking at Nibiru, measuring its progress and where the magnetic hosing from its N Pole was aimed, had sent a warning. They knew before it hit. Thus the Earth’s loss of its magnetosphere and Obama’s EO carried the same date – October 13, 2015. The Hillary-hugging media, NBC, promptly suggested Russia might be involved. Section 5. Implementation. (a) Within 120 days of the date of this order, the Secretary of Energy, in consultation with the Secretary of Homeland Security, shall develop a plan to test and evaluate available devices that mitigate the effects of geomagnetic disturbances on the electrical power grid through the development of a pilot program that deploys such devices, in situ, in the electrical power grid. The Obama administration is contemplating an unprecedented cyber covert action against Russia in retaliation for alleged Russian interference in the American presidential election. Current and former officials with direct knowledge of the situation say the CIA has been asked to deliver options to the White House for a wide-ranging "clandestine" cyber operation designed to harass and "embarrass" the Kremlin leadership. ZetaTalk Confirmation 10/22/2016: What do these intersecting events have in common, as a nexus. On October 13, 2016 Obama writes an EO seeking to mitigate electro-magnetic-pulse (EMP) destruction of the electric grid in the US. EMP caused by the charged tail of Nibiru has been on the increase for several years, the latest example the Hoboken crash. 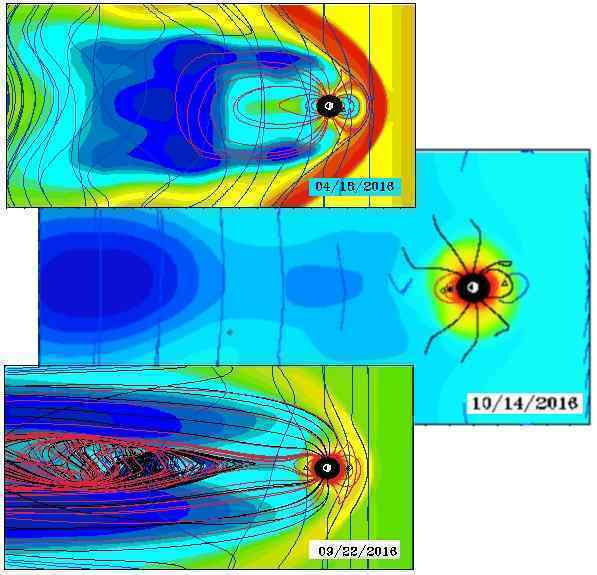 Then on October 14, 2016 the BATSRUS charts paint an astonishing picture of the Earth’s magnetosphere, which seems to have virtually disappeared. Then on October 14, 2016 NBC news reveals that the CIA has been planning cyber attacks against Russia, who has been accused by the Clinton campaign of being behind the release of hacked Wikileaks emails. Of course blaming the Sun, the standard cover for Earth changes caused by Nibiru, was instantly employed by the media, despite the fact that “space weather” covers the region between the Earth and the Sun, that region currently inhabited by Nibiru and its vast charged tail. As President Barack Obama's administration enters its final stages, he's paying more attention to what's going on way, way above us than expected. The famous Carrington event of 1859 started when a large burst of solar plasma -- called a coronal mass ejection -- caused a huge geomagnetic storm. The popular GodlikeProduction forum lost no time in pointing out that there was a relationship between the 120 days, which ends on February 10, 2017 and the Inauguration date for the new President, which occurs on January 21, 2017. How does President Obama expect to be reviewing the options for this plan in February, when he will presumably no longer be President? It speaks to his intent to go into a Third Term. In Utah they are installing electromagnetic cages around all of the substations. Maybe ET has EMP side arms. … Guess we know what the new Russian super weapon is. … There are no pending space storms incoming that merit this inauguration timed threat. … Yup. It's Nibiru. Duck and cover. It's also why the Russians are testing out their shelters. … Hmm so King O could say US is under attack and stay. … Look to the sky today. Our magnetosphere is collapsing as we speak. … That’s it. Cancel the election and roll out martial law. … "Space weather" means variations in the space environment between the Sun and Earth (and throughout the solar system) that can affect technologies in space and on Earth. 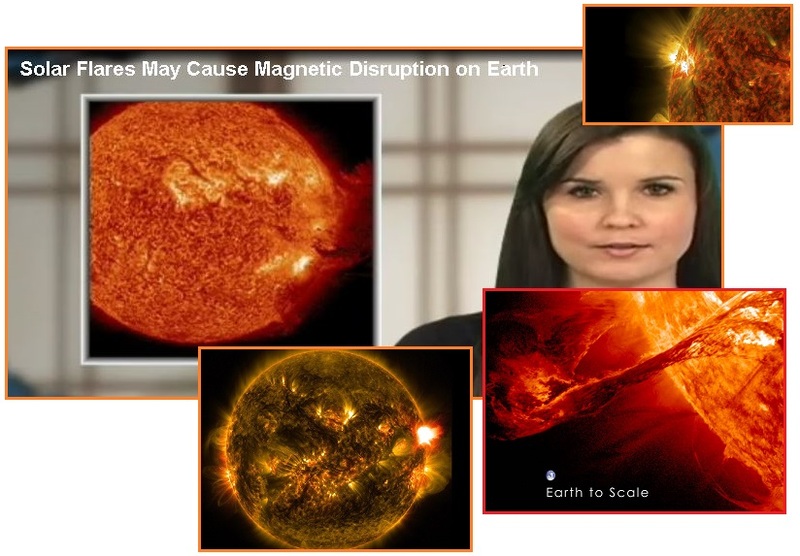 The primary types of space weather events are solar flares, solar energetic particles, and geomagnetic disturbances. … Interestingly, this order calls for actions to take place both days before Obama is slated to leave office, and months afterward. Why, it's almost as if he expects to still be in charge. ZetaTalk Confirmation 10/22/2016: We have been saying for many months that the Council of Worlds would provide cover to Dunford, if necessary, so that he could prevent the Clinton/Bush crime family from marching into the White House. This would likely be an event such as a severe wobble or the New Madrid adjustment but the Council has many options at its disposal. Blackouts and EMP would certainly be one of them. We have also been saying for many months that to prevent a Clinton stolen election, the 2016 election would likely be deferred or delayed, allowing Obama a Third Term. Countering election fraud by the Clinton/Bush crime family would otherwise present Dunford with a combat zone in all 52 states, an impossible task. What is the purpose of the Executive Order requiring a plan to combat EMP, giving the Department of Energy 120 day to produce this plan? 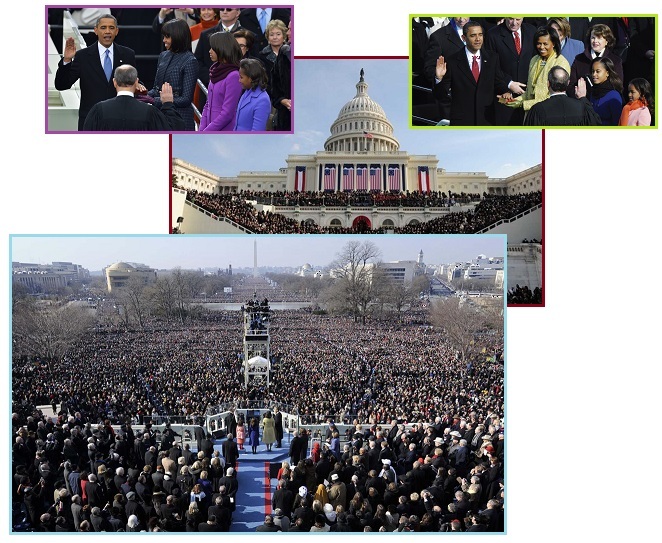 This date lands after the inauguration date for the new President on January 21, 2017. But both Obama and Dunford know that date would not be reached before action to halt the 2016 elections occurs. 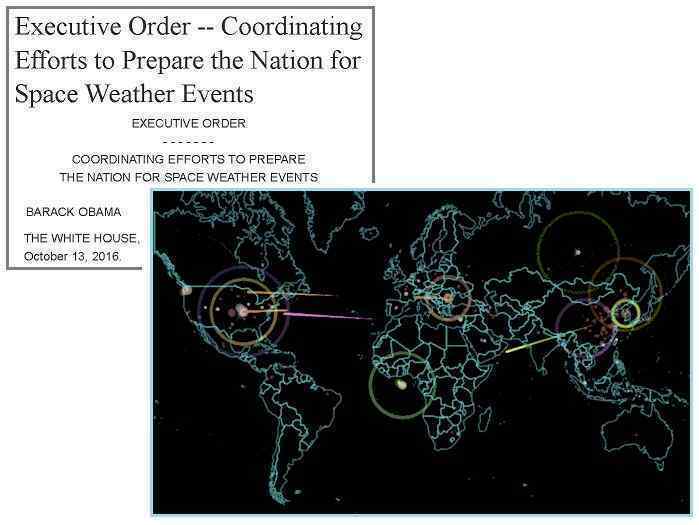 This EO is to provide the media with material during discussions on what is likely to be increasing magnetic storms, blackouts, power outages, and the chaos that follows. Meanwhile, the fact of Nibiru as a near and present danger will likewise become obvious. High drama ensued at the Ecuador Embassy in London where Julian Assange had sought asylum lo these many years. There were rumors of a scuffle, someone being led away with a black hood over his head. Rumors that the Embassy was going to be entered with Julian taken away, or perhaps he was dead. Rumors that a visitor, Paula Anderson, had poisoned Assange with a sandwich. People panicked after Wikileaks revealed that an unknown man had climbed the building where Assange has been holed-up for four years. 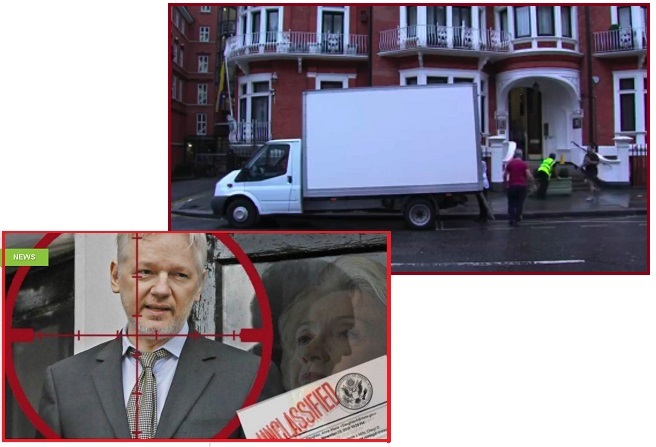 Reports showed a removal van being loaded outside the Ecuadorean embassy, prompting rumors that Assange was to be evicted. Rumors have started doing the rounds that Julian Assange has been physically removed from the Ecuadorian embassy by the London Metropolitan police. A man, with a black bag over his head, had been escorted from the building by police. They alleged that this occurred just 30 minutes after the WikiLeak’s founder’s internet was cut. What was clear is that Assange was no longer in communication via Internet, cut off by a “state party” which was soon identified to be the Ecuador Embassy itself. 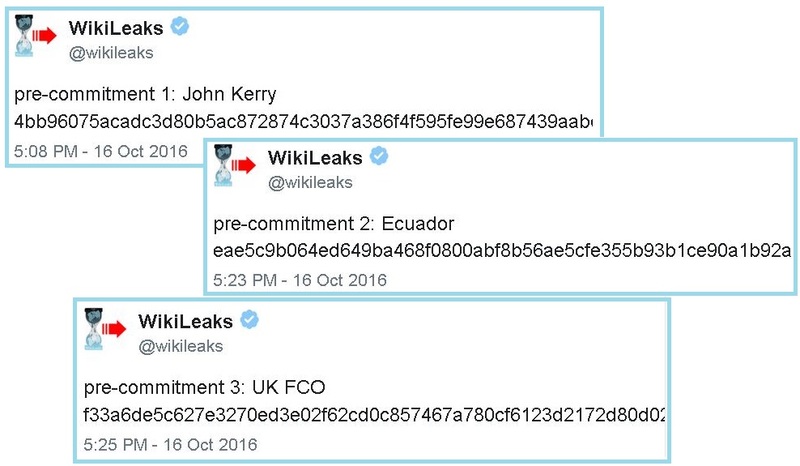 On 16 October 2016, WikiLeaks posted a series of cryptic numeric tweets, leading many onlookers to conclude that founder Julian Assange was in danger and likely dead (and thus a dead man's switch had been activated). Not long after the mysterious tweets appeared in October 2016, a Twitter account associated with Anonymous asserted that they were not indicative of harm coming to Assange — he was presumably, fine and the tweets were a form of data integrity verification. Midway through releasing a series of damaging disclosures about U.S. presidential contender Hillary Clinton, WikiLeaks founder Julian Assange says his hosts at the Ecuadorean Embassy in London abruptly cut him off from the internet. The news adds another layer of intrigue to an extraordinary campaign. 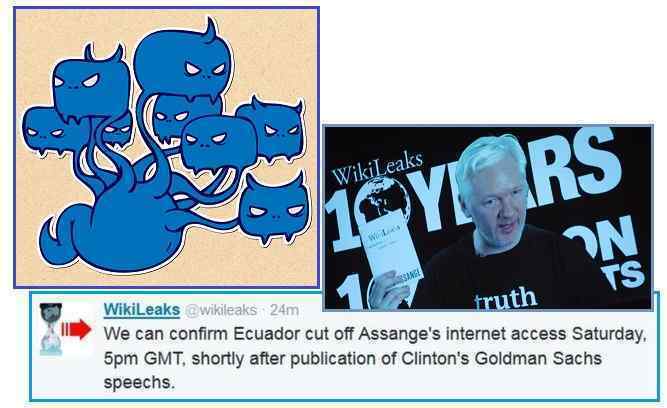 "We can confirm Ecuador cut off Assange's internet access Saturday, 5pm GMT, shortly after publication of Clinton's Goldman Sachs (speeches)," the group said in a message posted to Twitter. Had Ecuadorean diplomats lost patience with their famous Australian houseguest? Had there been some other kind of confrontation? WikiLeaks said unspecified "contingency plans" were in place and its Twitter account was still active. It released the latest tranche of emails from senior Clinton ally John Podesta, suggesting that, for now at least, the group's ability to publish has not been compromised. Wikileaks tweeted an explanation that the source of the pressure for Ecuador to stop the Wikileaks was none other than US State Department Secretary John Kerry. Secretary of State John Kerry demanded that Ecuador stop Wikileaks from publishing documents damaging to Hillary Clinton’s campaign back in September, according to a bombshell claim by the whistleblower organization. In that it seemed clear that Assange was in danger, and the normal diplomatic rules about Embassy security were to be tossed to the wind in deference to US State Department demands, the series of codes tweeted by Wikileaks was taken at first to be a “dead man’s switch”, ie codes to release insurance files which held the most damming information. A dead man's switch is a switch that is automatically operated if the human operator becomes incapacitated, such as through death, loss of consciousness, or being bodily removed from control. A more extreme version is Russia's Dead Hand program, which allows for automatic launch of nuclear missiles should a number of conditions be met, even if all Russian leadership were to be killed. A similar concept has been employed with computer data, where sensitive information has been previously encrypted and released to the public, and the "switch" is the release of the decryption key, as with WikiLeaks' "insurance files". If anything happens to Assange or the website, a key will go out to unlock the files. There would then be no way to stop the information from spreading like wildfire because so many people already have copies. On 17 August 2013, WikiLeaks released another three insurance files. Like previous insurance files, the contents of these three insurance files are still unknown. On 3 June 2016, WikiLeaks released an 87.6 GiB AES-256 encrypted insurance file. Had Assange been killed? If still alive, was he still at the Embassy? No one seemed to know for sure, although Wikileaks was assuring the public that he was indeed alive and well and the Zetas confirm. ZetaTalk Insight 10/22/2016: Is Assange dead? No. Is he still at the Ecuador Embassy in London? No. One of the rumors floated early during this current kerfuffle was that a man with a black hood over his head had been led from the Embassy. This was Assange, and he is long gone from the UK, with friends, and quite safe in an undisclosed location. Assange cannot be reached via Internet at the Ecuador Embassy as this was part of the escape plan. Until he communicates from a new location, or as a disembodied entity seemingly in outer space, they will not reveal that he has vacated the Embassy. Indeed, there is no other way to explain the dramatic win Sanders achieved in Michigan, where all the polls showed Hillary up by 20 points, yet she lost to Sanders by 2 points in the Primary. Poll rigging has been demonstrated in the race between Hillary and Trump too, where pollsters mix in far too many Democratic voters until the desired status for Hillary is reached. He won the Michigan primary over Hillary Clinton, 50 percent to 48 percent, when not a single poll taken over the last month had Clinton leading by less than 5 percentage points. 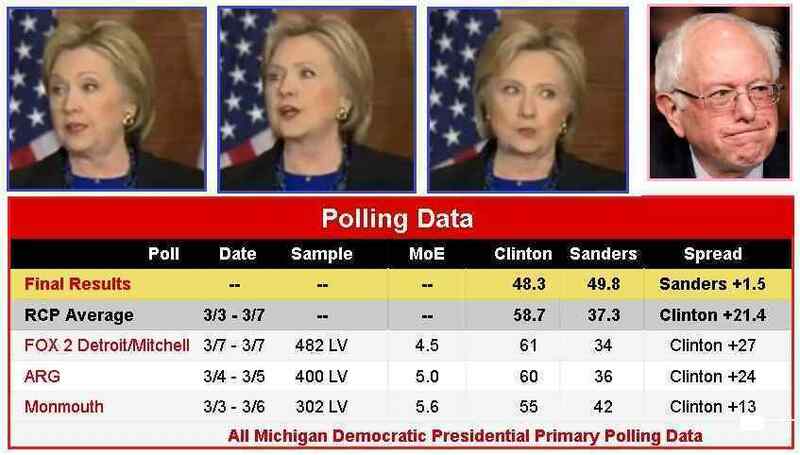 In fact, many had her lead at 20 percentage points or higher.